Okay, I lied. Last week I announced the end of Game Friday. But this week, I got the opportunity to interview Jason Nelson, creator of digital art and avant garde game wonder game, game, game, and again game and how could I resist? Jason Nelson is a lecturer in cyberstudies/digital art/digital creative writing at Griffith University in Queensland, AU. He started out as a poet, started messing around on the internet with digital media, and launched into a series of highly unusual interactive projects. Jason kindly stayed up until 3am to talk with me about art, poetry, and the challenges of engaging users in something really weird. The interview includes stories about some of his projects, and a delving into questions about what makes viral content compelling, how to draw people into an uncomfortable environment, and ways that art--or museum content--can become more pervasive by being hidden in the corners of life. What do you think has made you successful? At first, it was a surprise. game, game, has had about 5 million hits. I released it in a decentralized way—which means I didn’t know what I was doing. I’d find a blog and say you might be interested by this—and then it spread out. I’m really fascinated by the viral web. I grew up in Oklahoma. No one knows about it, no one wants to live there. But there’s a lot of unexpected beauty in Oklahoma—weird folk art with plastic deer, a beautiful house. And I think that’s kind of what happened with some of my work—people didn’t really expect it. So it felt like something they found, an experience they owned, and they wanted to share it. I find it fascinating how on Youtube, something will get 2 million hits really quickly, and then it dies off. People don’t want to share it anymore once it’s huge. game, game, and... just won an Italian art award. As an artist and a lecturer at the university, I'm expected to put my work up in competitions as art. But then these kids blogging it on car mod sites—they’re finding it without realizing it’s an art work. That lack of expectation is kind of a wonderful thing. For institutions, which brand themselves with a consistent experience, it’s really hard to translate an unexpected find. You're bringing up a great point--that the things that become successful on the viral web do so because they feel personal, like you found a secret to share with someone else. How could we embed these secrets, these hidden discoveries, into museums? I think you could easily go into a physical space and hide things. Everyone else, make your exhibitions. And then we’re going to hide something underneath the exhibit about eggs. Or about gravity. And then it becomes this great thing that people discover—the surprise. That’s what I think a lot of physical spaces are lacking. This is what I'm trying to do with dispersed fiction: to hide it all over the web. It’s this idea of taking your fiction or poetry and dispersing it out on the web in places where people can enter things—like into an Amazon book review. You make up a unique keyword and use that in all the entries. So then someone can search google and find everything out on the web via that searchable term. It’s kind of like—let’s put our exhibitions in the corner of a grocery store, in a gas station. And I think museums would like to do that, but they don’t really have controls over what happens with the material in those public places. So when you deal with Second Life, for example, it seems like an ideal place to do that, because you don't have to worry so much about the physical materials, so you could actually go in and put bits of an exhibition in lots of different places. So as people wander around, they could find these things. I also think people connect with my stuff because it flirts with failure. How do you make something that’s messy, that isn't polished, that seems almost kind of broken? A lot of the content on the net is so polished. And I think there’s something engrained in us that wants error. The messiness of your work is definitely something that makes it really distinctive. But when we talk about hiddenness, there's this problem. Does this kind of stuff have to exist as a reaction to and on the edges of something more polished? Or do you think it can hold up on its own? How much messiness could people handle? When I lived in Bowling Green, the museums in Ohio used to bother me with exhibitions like The Art of Star Wars. I understand why they're doing it, but it's no anti-failure that it becomes dull. And really it’s just designed to meet the centerpoint. Here in Queensland they have an Andy Warhol exhibit coming up, and it’s just plastered everywhere. And I think these shows really injure institutions by not sharing the diversity and range of work out there, by focusing on these standard things. The blockbusters. They're safe. So where does that leave risk and messiness? I think people want it, and they're willing to tolerate a lot of weirdness if it reaches them in some way. Uncontrollable semantics was this project I did that had a hidden page in it that I'd forgotten about. I kept getting these email messages that said "Cease Me Cease You." I thought it was spam. But then I started getting hundreds of these emails, and finally someone sent me an email address that referenced a file name. And I found this hidden page again, where you have to wait for two minutes, and then it says, “Email me at this address with the words Cease Me Cease You." And I think people wanting to come to these sites would really be open to these kinds of things. If you’re in academia, or art, or museums, you sort of focus on the boundaries, wanting to learn where they are. And I think we could leap way outside the boundaries and people would be really accepting of it. In the case of my work, people are reacting to something highly unusual in the field, but they don't see it that way--they don't know where the boundaries are. What they do need is some kind of foothold or entry point, something that makes them comfortable saying, "I have no idea what it means but I really enjoy it." Is that entry point a game interface? A sound? Anything that can draw them in and then the rest gets really wild and crazy. As long as you give them small rewards along the way and congratulate them when they reach some goal. Doing something weird always comes back to comfort with failure. How do you identify failure when you're working in an extremely strange space? Is it about numbers? Or about how you personally feel about the piece? Can you give me an example? The most recent example would be the zombie game. When I finished it, I hated it. I was glad it was over. I think it has a lot of nuances in it, but it’s also really difficult to get through. It’s a little annoying. And I usually love art that's annoying—but it wasn’t accessible enough. But it was also a failure because I tried to reach an audience rather than approaching it from my own voice, and the result was that that audience--game people--felt that maybe I was mocking them. One thing I think is important is making exhibitions that don’t require a lot of prefacing. I find conceptually-based art very problematic. I want to jump right into the middle of it. Maybe the experience won’t be totally obvious or opaque, but it will be enjoyable. There's a contradiction here. You're talking about avoiding targeting a particular audience, but then also giving users an access point. In museums, we often start by thinking about the access point--how can we draw visitors in and connect with them. How do you reconcile the personal desire for wildness with a desire to support an audience? You just need one access point. You can have eight facets of a project that are wild and one that connects to people to be accessible. For example, I’m modifying a digital midi theremin as an alternative mouse device. It's a normal theremin with a midi output. I’m using the data sets from the midi to drive the mouse motion. It’s just an interface device, a part of a larger artwork. The theremin interface is the carrot, a performative way to interact. The idea is to draw them in that way. Are there any other projects you are working on that you're really excited about? 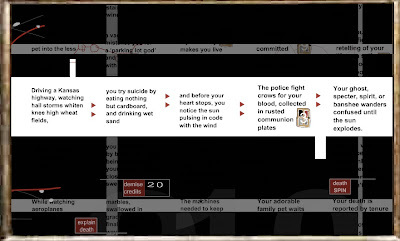 I'm working with speech to text software to filter outside sound and create poems. I’ll play a movie or political speech, run it through the speech to text program, and it will spit out this crazy, very poetic stuff. I started doing it because I was playing with the program one evening and I accidentally left it on during a thunderstorm. And when I woke up the screen was full of text. At first I was afraid that someone had broken in—and then I realized the software was getting the sounds from the storm and turning them into words. This conversation with Jason really inspired me to hunt out strange phenomena and find ways to slide them in under the rug in museums. 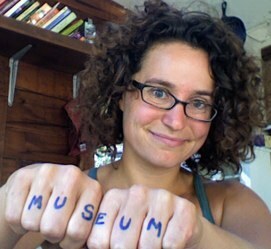 But I'm left with the same question we batted about during the talk: how much of this can museums handle? Does it have to be on the periphery to be appreciated? What do you think? "Doing something weird always comes back to comfort with failure." I'm afraid that too many museum administrators think weird=failure. So instead we get these blockbusters filled with mushy pre-digested safe ideas. Thank goodness for places like The City Museum!